Подробный обзор фонологии (науки о звуках речи) каталанского языка. Для специалистов. This is the most comprehensive account of Catalan phonology ever published. Catalan is a Romance language, occupying a position somewhere between French, Spanish, and Italian. It is the first language of six and a half million people in the northeastern Spain and of the peoples of Andorra, French Catalonia, the Balearic Islands, and a small region of Sardinia. Dr Wheeler describes Barcelona pronunciation and the major varieties of western Catalonia, Valencia, and Majorca, and considers social and stylistic variation. The author's approach is through a clear, pragmatic version of orthodox Optimality Theory and is informed by close attention to articulatory phonetics. 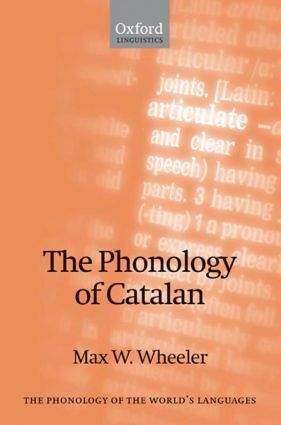 He includes a substantial account of post-lexical (phrasal) phonology and has designed his approach to be of maximum use to those seeking either to understand the phonology and morphology of Catalan and its varieties or to set these within a comparative or typological perspective. After an introduction to the varieties of Catalan the author devotes chapters to segment inventories; syllable structure; phrasal phonology; coda voicing; coda place; cluster reduction; epenthesis; stress and prosody; word phonology and allomorphy; and the syllabification of pronominal clitics. The book is fully referenced and contains a comprehensive bibliography. It is likely to be the standard account of its subject for many years.